(Nanowerk News) Direct delivery of therapeutic compounds to cellular targets can enhance drug efficacy and safety, but such techniques require careful monitoring within the body. Now, a research team led by Julius Vancso at the A*STAR Institute of Materials Research and Engineering in Singapore has developed polymer microspheres labeled with fluorescent quantum dots that promise to light up the pathways of critical biological processes ("Stimulus Responsive PNIPAM/QD Hybrid Microspheres by Copolymerization with Surface Engineered QDs"). Scientists often attach fluorescent markers, such as chemical dyes, to biomolecules to track their movements inside living cells. Quantum dots—semiconductor nanocrystals with extraordinary light-emitting capabilities—promise to radically advance biological imaging by offering a brighter, longer-lived source of fluorescent light than any comparable dye. Incorporating quantum dots (QDs) into living systems is challenging, however, because the long, hydrophobic carbon chains typically present on the surfaces of QDs make the dots insoluble in water. “Nature uses water as a solvent in over 90% of its chemical reactions,” says Vancso. “If one wants to benefit from the superior optical properties of QDs, they must be rendered water-soluble.” Unfortunately, typical chemical techniques to modify the hydrophobic chains can cause QDs to lose their fluorescence. The researchers used an amphiphilic polymer coating—a material containing water-repellant and water-stable chemical groups—to transfer cadmium selenium/zinc sulfide (CdSe/ZnS) QDs into an aqueous environment. Long carbon chains tethered this coating to the QD surface without compromising fluorescence output, while a carboxylic acid-rich polymer backbone provided the essential compatibility with water. Vancso and his co-workers also incorporated acrylic groups—well-known polymerization units—within the QD coating to impart new functionality. 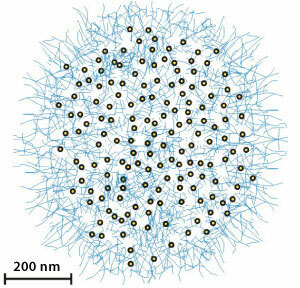 When they exposed an emulsion of coated QDs to ultraviolet light, the acrylic groups joined together into a three-dimensional network, eventually yielding micrometer-sized poly(N-isopropylacrylamide) (PNIPAM) spheres encapsulating uniformly copolymerized fluorescent QDs (Fig. 1). PNIPAM-based materials are unique because they can undergo temperature-dependent structural transformations. When the researchers heated a solution of PNIPAM microspheres above 32 °C, they observed an abrupt increase in optical absorbance; at this critical temperature, the internal chains of the spheres collapsed, expelling water and changing the optical refractive index. Because these microspheres can repeatedly expand and shrink while maintaining strong fluorescence emissions, they have the potential to act as ideal tracers for drug delivery devices. According to Vancso, this method for entrapping QDs is universal in nature, and can be used with other nanoscale technologies. “This work should allow one to also functionalize magnetic nanoparticles, which carry tremendous promise in bio-imaging and diagnostics,” he says.